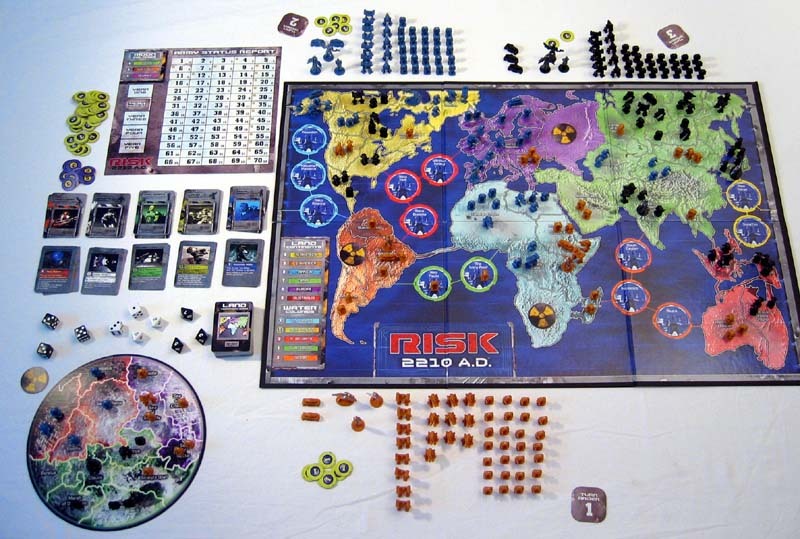 Imagine the classic Risk game being revised to fit a completely different theme, from the Napoleonic War to science fiction. 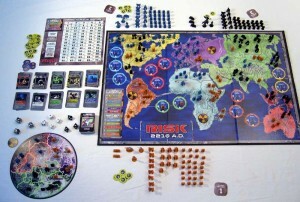 While the classic Risk game is indeed a great game with solid gameplay, but there had always been yearning for something more. Since the core gameplay ruleset is quite flexible, there have actually been variations to the game that have taken off, letting players experience it in many other ways, and a sci-fi variant was certainly not far behind. What is Risk 2210 AD? 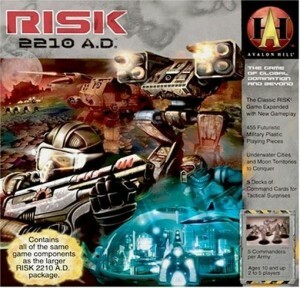 From Avalon Hill, Risk 2210 AD was first published back in 2001 as a futuristic version of the classic Risk game. It was designed for play by 2 to 5 players from ages 10 and up, and each game can last up to 3 to 4 hours. 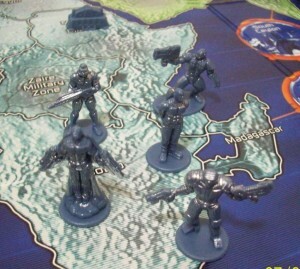 For the most part, it’s similar to classic Risk board game in that most of the game is acquiring armies to attack and defend territories, but this variation does more by adding the Moon as another accessible map with conquerable territories, which also adds more to the strategy gameplay. 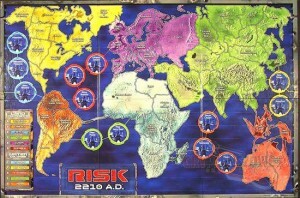 Having that other area to worry about while worrying about conquering and defending continents on Earth constitutes some strategic juggling that requires even longer term thinking than in the classic Risk game. The Moon is basically another map with restricted access; you need to gain access to the Moon first before you can take territories there. There are some great advantages to controlling the Moon, and it can greatly help you in winning the game. 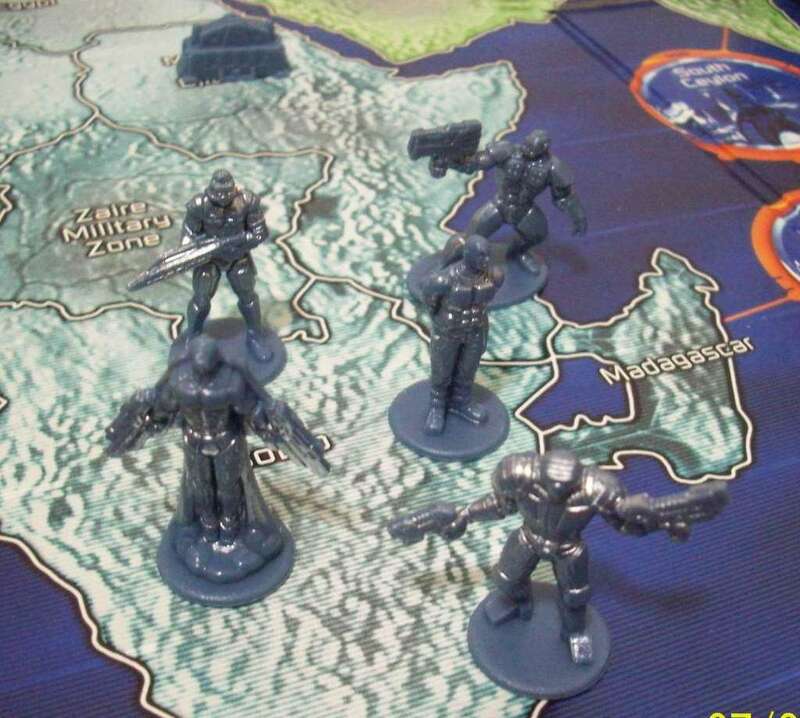 Because of that, playing Risk 2210 AD isn’t exactly like playing classic Risk. Of course, the most notable addition to this game is the Moon itself. You can’t really ignore the Moon in this game and just play Risk 2210 AD like classic Risk due to the additional advantages that the Moon avails being incredibly powerful, especially during the late game. Also, you can also control the waters with your navy, which adds more balance to the game due to certain territories in classic Risk no longer being safe havens as they’re now made more accessible through the water. The same can be said about the Moon as once it becomes accessible, anyone can race up to it. Territory Card sets are no more, so the late game won’t have floods of reinforcements making comebacks impossible, which can make the game more enjoyable longer. Players who are behind can now have a chance to come back from seemingly certain defeat, so long as they make the right decisions. This has become what makes Risk 2210 AD a hit for longtime Risk players as its changes and additions bring new ways to experience the game. There are Nukes, which is definitely what shakes things up in Risk 2210 AD. It’s both a reward for those who have played well thus far and a comeback mechanic for those who’ve been losing for most of the time and yet somehow got a hold of Nukes to turn the tables. It’s not unlike the Major Command Game of NUKES Risk online in terms that it can definitely change the balance of power. It can also be a gambit for those in the lead to secure their victory as it trades safety for great reward with one shot. As with the classic Risk board game, and also with the Risk online games, there’s fun and frustration in the chaos courtesy of the dice roll. Additional 8-sided dice are included with the usual 6-sided dice to determine attacks when players have acquired commanders, which is what helps break stalemates and facilitates more action in Risk 2210 AD. Winning players can gain more momentum by getting commanders while losing players can come back from adversity with them. Perhaps there are things some players may find peculiar or weak in this game. For instance, there’s no way to aim Nukes, which is strange, and the Moon turns out to not be as big of a game-changer as it should be, only being extra space like the seas. It’s also quite hard to get there since there are only 3 lunar landing sites that can only be accessed from Space Stations, which are only applicable to players who possess a Space Commander. That’s a lot of hoops to jump through in order just to gain some extra territory. It’s pretty much a standard Risk game with extra stuff added to it, so it retains much of the uncertainty in its gameplay. While you can indeed become very skilled in this game, you’re still dependent on the luck of the dice roll that may mess things up for you if you ever roll low. It’s all about stacking the advantages to your favor in order to account for bad luck that may come your way, and that also means players at a deficit have a chance to bounce back if they can salvage and regroup. For the most part, experienced Risk players will find the additions in Risk 2210 AD to be quite welcome as they don’t fetter too much with the original Risk game. It’s pretty much a Risk game with some changes that make it more exciting overall as there are now more ways to win and to lose. Some people ask about prices. This is the cheapest I’ve found. I’ve added an Amazon link. I’ve seen some used ones for as low as $23.45. If you click the link remember to check used ones too! I have a few hardcopy risk games, and this is my favorite.